San Diego has its fair share of haunted locations but have you heard of the ghost that haunts Ocean Beach (OB)? 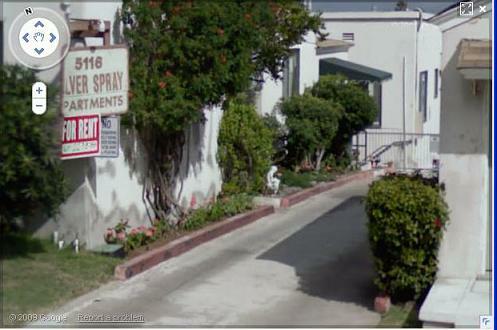 The Silver Spray Hotel was built in 1919 on the legendary site of Ocean Beach’s (OB) first “homeowner” Captain Thomas. The hotel included a spa, indoor skating rink, dance hall, saltwater pool, and a high vaulted “plunge” which, consisted of two high vaulted diving boards. As the era of resort days faded, the vacation bungalows next to the hotel known as, “Camp Holiday” were rented out for $35 to $40 dollars a month which included use of the saltwater pool. Today the building serves as The Silver Spray Apartments of Ocean Beach. The unique and interesting history of the Silver Spray Apartments (Hotel) could, by itself, draw paranormal investigators but, there is more to this story. 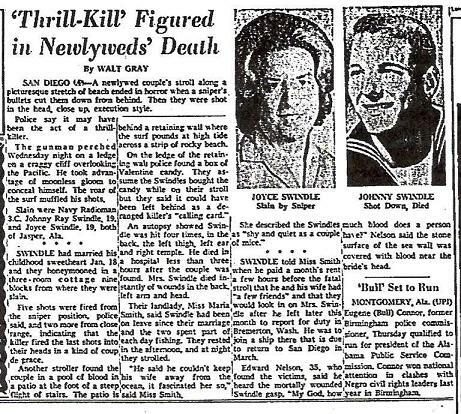 On Wednesday, February 5, 1964, Navy radio-man third class Johnny ray swindle and his newlywed wife Joyce were violently murdered along the Ocean Beach Boardwalk next to the Silver Spray Apartments. 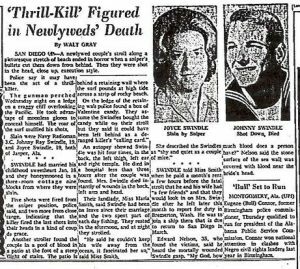 Swindle had married his childhood sweetheart on January 18, 1964 and they stayed in a three room cottage nine blocks from where they would eventually be slain. According to the San Diego Union Newspaper, “five shots were fired from the sniper position above. Police said two more were fired at close range. Indicating that the killer fired the last two shots into their heads in a kind of coup de grâce. Some (OB) Ocean Beach locals believe the spirit of Joyce Swindle remains here on Earth forever walking the same path she did in life, with her husband on that fateful February night. She has been heard screaming out an unintelligible name, possibly that of her husband or maybe even her killer. Some residents of the Silver Spray Apartments claim to leave the lights on in what remains of the old ballroom to, “keep the ghost quiet”. Other persons believe Joyce swindle haunts the halls with her cries and footsteps, forever looking for her husband who died in the hospital and not by her side. One Response to "Ocean Beach Ghost of Joyce Swindle and the Zodiac Killer"
The year the Silver Spray Resort opened was 1917. I live in the Silver Spray Apartments and know it’s history quite well. Additionally, I have experienced first hand the hauntings of Joyce. She enjoys waking me up in the middle of the night to glass crashing on my kitchen floor. When I check the kitchen to see if a rat has knocked over a glass I quickly realize that nothing is broken at all. This repeats about 2 or 3 more times throughout the night. If she’s a ghost haunting my apartment… she’s a clean one!